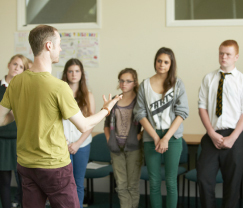 Backstage Pass offers fully subsidised places for young people to participate in the Richmond Youth Theatre’s Creative Learning programme of courses. There are youth theatre, musical theatre and technical theatre courses, as well as activities for half term holidays. Due to the costs involved, many of the talented young people in our community cannot access the excellent training, peer and tutor support and the confidence-building opportunities the courses offer. This initiative supports those in our community whose background and circumstances are a barrier to developing their talent for performance. There are many who are not able to participate in activities that will develop their innate talent, due to family issues, financial hardship and/or lack of support and guidance. There are also those who are not aware that such opportunities are available to them. Backstage Pass enables those who have a talent in this area to access a high quality experience and training. Participants will also have the opportunity to invite their family group to two performances at Richmond Theatre. We select students eligible for support by working closely with local schools and colleges, delivering taster sessions at after school clubs etc. We also work with local community clubs to identify talent and need. If you are involved with a local school or community group and could help us to identify eligible students, please get in touch with us. If you think you may be eligible for Richmond Theatre Trust support, please contact us.